Winnipeg City Council has voted to support a referendum on the opening of Portage and Main during the fall election. Green Action Centre does not support the plebiscite for this infrastructure project, as no other road projects are put into the hands of citizen referendums. As noted by others, if Winnipeg had held a referendum on the Red River Floodway it would never have been built. We can also see “Portage and Main” is being used as a political wedge issue, diverting the campaign focus from other important issues such as homelessness, transit, mental health and addictions. However, since the referendum has been called, Green Action Centre wants to use this opportunity to engage the citizens of Winnipeg on the larger issue of how we build our roads, and how their design has traditionally prioritized the movement of cars over the movement of people. Check out Part 1: Tear Down These Walls! Green Action Centre has always advocated for walkable, bikeable, transit-friendly neighbourhoods. As such, we encourage the City of Winnipeg, and all citizens, to place the safety and comfort of those walking, biking and taking transit above the convenience of those in personalized motor vehicles. We recognize the needs of large transport vehicles to move goods within city limits, but we do not support our dense urban centre putting the convenience of transport trucks ahead of safe, walkable neighbourhoods or those who live, work or play in our urban core. Thank you to the Vote Open Winnipeg campaign for presenting the facts and figures around this intersection. 6,200: The number of cars that pass through the intersection at peak rush hour. 54: The average number of seconds added to an afternoon rush hour commute after pedestrians are reintroduced. 24: The average number of minutes in a Winnipeg commute. 18: The average number of seconds added to a morning rush hour commute after pedestrians are reintroduced. 400: The number of meters someone who can’t navigate stairs must travel to cross the street when the office buildings are closed. 9: The average number of minutes it takes to cross using a wheelchair in the underground. 4: The number of elevators someone must use when crossing underground in a wheelchair. 2: The number of ramps someone must use when crossing underground in a wheelchair. 4 million: Number of people attending events downtown every year. 800,000: Number of tourists that come to Winnipeg from outside of Manitoba each year. 110,000: Number of people who live, work or study downtown every day. 17,000: The number of downtown residents, up from 9,000 in the 1970’s. 15,000: The number of people who work within 100 meters of Portage and Main. 2,300: Number of hotel rooms downtown, with two more hotels under construction including one on Portage Avenue East. 2,000: The number of pedestrian crossings at Portage and Main anticipated by the City of Winnipeg in the busiest one hour of the day. 600: The number of new residents living Winnipeg’s tallest building (42 stories) under construction a block away from Portage and Main. 3 billion: The number of dollars invested in downtown Winnipeg in the last decade. 1 million: The anticipated construction cost to remove the barriers. This includes $2.3 million contingency to cover cost overruns. 82: The number of City of Winnipeg capital projects currently underway with a value of more than $5-million. Winnipeg has changed since 1979. We now have a booming Exchange District, revitalized Downtown, and The Forks has transitioned from a rail yard into a busy tourist hub, including the Canadian Museum for Human Rights and a new residential area that will be added in the next few years. Portage and Main is a natural connector of these areas. The fact that the intersection is now a vortex, with neglected surface parking lots and few people, speaks volumes about how the barricades have negatively impacted development in this area. The Forks was an abandoned rail yard when the barriers went up. Today, thousands of people gather during all four seasons! Street design has changed since 1979. Planners will draw on designs from similar intersections around the world to create a beautiful cross-way that accommodates the smooth flow of pedestrians, buses and bikes through the intersection, as well as personal motor vehicles and trucks. Scramble crossings, transit priority lights, resyncing of lights, and many more design options are successfully used at similar intersections around the world. We can already see the interest people have in bussing, biking and walking. Despite our incomplete, unconnected cycling infrastructure, 20% of Winnipeggers say they currently bike regularly, while 35% would cycle more if conditions were better (CAA and Bike Winnipeg survey data). Green Action Centre’s Workplace Commuter Options program regularly engages with businesses, organizations and institutions in Winnipeg to conduct commuting surveys. When asked how they currently commute, workplaces often have a high number of employees who drive alone. When asked how they would PREFER to commute, the drive alone number falls dramatically, with transit, cycling and carpooling often being the preferred option. This is why all road projects should prioritize the safety and comfort of healthy, sustainable travellers first to capitalize on the large number of people who would choose to commute in another way. This is key to tackling congestion and reducing our GHG emissions. All around the intersection were full bike racks. People riding for their everyday commutes is on the rise. Are we building for this change in behaviour? Portage and Main does not currently meet accessibility standards. In the data above, we can see how difficult it is for those with mobility issues to travel through, or around, the intersection. To have “the heart of the continent” not meet accessibility standards reflects poorly on us as a city. All citizens should be able to access and cross this intersection with dignity. Portage and Main has many safety issues due to the current design. As outlined by Jill Coubrough in Safety Concerns Have Women Calling for Portage and Main to be Reopened, the current design has many dark and poorly lit places that pose a risk to women and vulnerable people. Most importantly, the lack of street life creates the biggest safety, or perceived safety, barrier. We must always encourage design that increases the number of “eyes on the street” (Jane Jacobs). 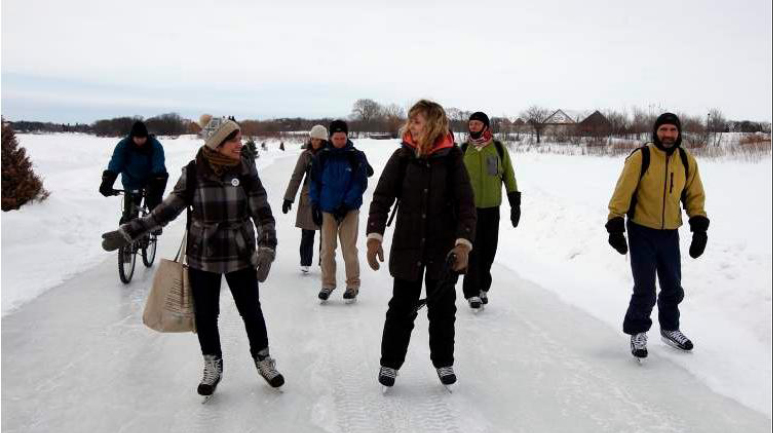 Further details on the benefits of walkability to neighbourhoods is outlined in CityLab`s Walkability Is Good For You. 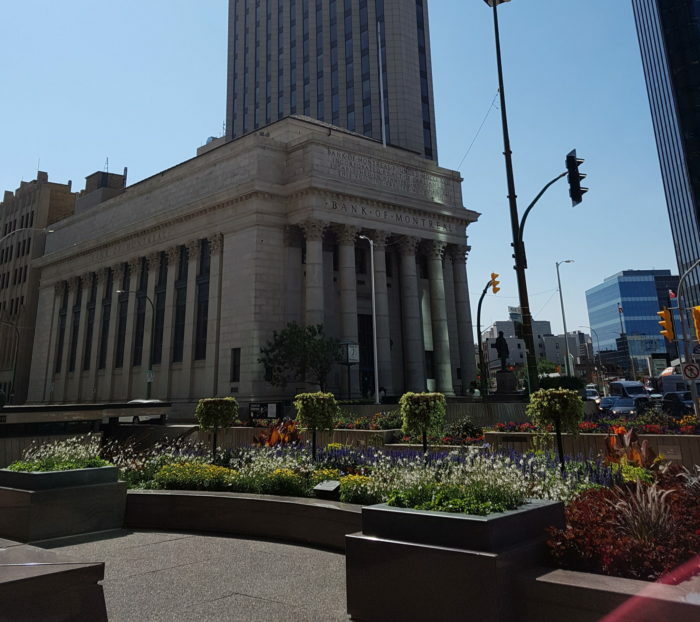 Opening Portage and Main will benefit the city financially, as the plethora of neglected surface parking lots will be more appealing to developers. The Downtown Winnipeg BIZ, The Exchange District BIZ and CentreVenture, as well as the owners of the four corner towers, support the opening of the intersection as they recognize that more people on foot and bike is good for business. With the barriers up, people are not using Portage and Main, the natural connector of neighbourhoods like The Exchange, The Forks, St. Boniface and Downtown, to travel. Currently, it is void of life. But restoring people to the blocks around the intersection will once again connect these neighbourhoods and create the conditions necessary for shops, cafes, food trucks and other ventures to set up shop. In fact, Portage and Main might not serve as just a natural connector, but as a destination. 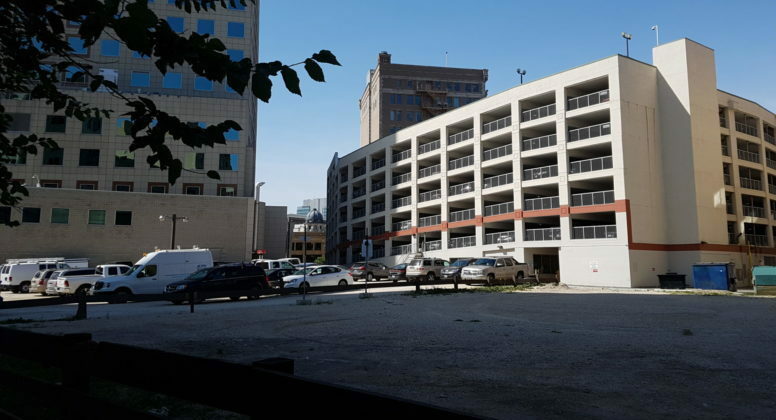 Instead of a vibrancy, the blocks around Portage and Main are primarily half empty surface parking lots that are poorly maintained. Imagine actual businesses here. Our heart is already beating at Portage and Main. Whether it’s a Jets celebration, an Idle No More Protest, or a Human Flag to celebrate Canada Day, we flock to Portage and Main. The barriers have created an unnatural vortex, and we believe removing them will restore the natural energy of the intersection. 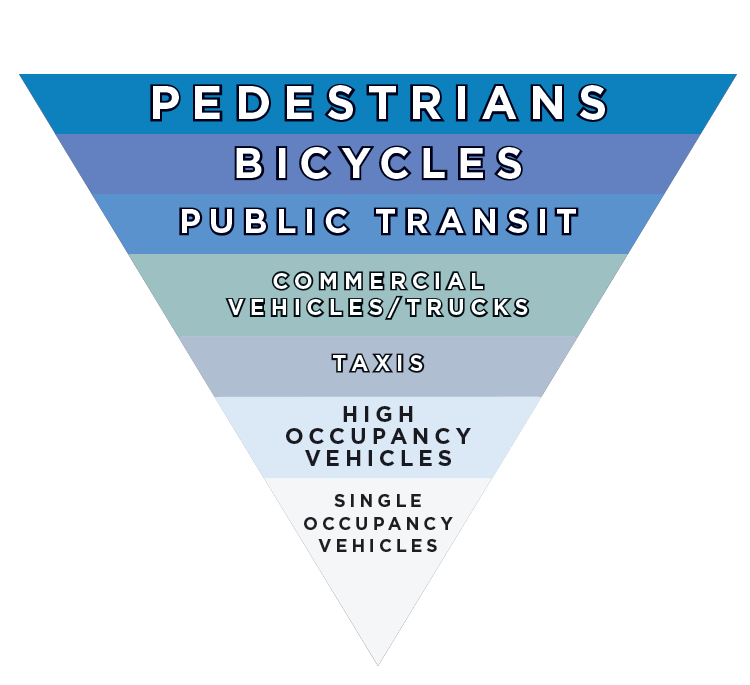 Levelling the playing field for Winnipeggers to walk, bike and bus over the convenience of single occupancy vehicles. Ensuring our city is accessible for people of all ages and abilities. Connecting the neighbourhoods and destinations that did not exist in 1979, when the barricades went up. Re-thinking how we prioritize the use of our streets, taking the full 168 hours of the week into consideration, not just 10 hours of ‘rush hour’ or peak travel. Analyzing the research and data in front of us as critical thinkers, and making a decision based on our collective well-being. Creating a downtown that is safe, vibrant and welcoming to those who live, work, and play in the neighbourhood each day, and to those who are visiting from around the world. Referendums for projects like Portage and Main can create division among citizens. However, Green Action Centre welcomes the opportunity to engage in a conversation around how we want to build our city for today and the future. We want Winnipeg to be built for people to live, work and play in the city, instead of being designed for motorized vehicles. We envision all Manitobans living green and living well, and we recognize that a big piece of that vision hinges on how our cities and towns are built. Great comment, Joan! Yes, this is indeed something the designers of the intersection would consider. After the Toronto attack, Jennifer Keesmaat (former Chief City Planner, and now running for Mayor) spoke to the CBC about this. Cities around the world are recognizing the added benefit that parking protected bike lanes (and protected bike lanes in general), as well as on-street parking, creates. We need to build streets that add the needed buffer-zone between traffic and pedestrians. And while cities do need to consider attacks like the van attack in Toronto, the real danger comes from how we’ve built our cities for cars to move quickly through, with little regard for people walking, biking and taking transit. Personal vehicles moving fast is the true danger for people in cities, and supporting reduced speed limits and other design elements is the way to go. It’s important to note the difference for drivers between driving down a wide road with few people, vs those driving down a road with the same speed limit, but with narrow lanes and active street life. You will find that cars naturally drive slower in these busy environments. I disagree. Very few people ever used the intersection of Portage and Main and I think there are many other areas that can be utilized and concentrate along the river and The Forks and Broadway; which all lean to St Boniface and other areas where we should use our tax dollars wisely. 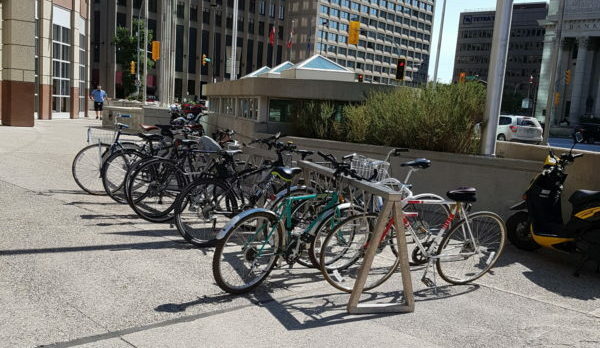 Portage and Main does not restrict biking; walking or our green space but it does help those who commute by bus to and from work and for other downtown events; and we should encourage more bus use as well as bikes/walking. Thanks for your thoughts, Elsa. Currently, very few people do indeed use the intersection as it’s such a dead zone. Looking to the 1970s for an estimate of use of the intersection is not the way to go, as our city is now so different. In the 1970s, the Forks was an abandoned rail yard, the Exchange District is booming and we have almost twice as many people living downtown as the 1970s (17,000 now from 9,000 in the ’70s). We can always argue about where money is “better” spent, but the reality is, the funds needed to properly reintegrate life into this intersection is tiny compared to most road projects currently underway in our city. And the ROI (return on investment) for this intersection is high, currently estimated at 18x. This is easy to see, as a walk around the current intersection reveals shabby surface parking lots that generate little funds for our city. We can do much better here.